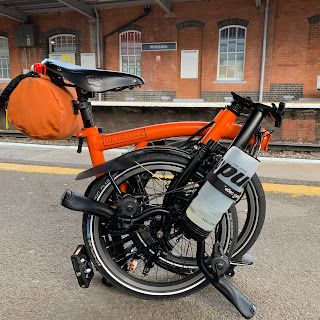 My Orange Brompton: A new addiction BlackBerry? Like many of you out there I have been a massive fan of the iPhone. In fact I am also an even bigger fan of my iMac, MacBook Pro and iPod. I have been straying recently however. Readers of my blog will already know that I purchased an ageing BlackBerry Bold 9000 as I wanted to use it for all my worked related stuff and have the iPhone for fun and general larkiness. Of late I have been becoming rather attached to my BlackBerry. I love the almost instantly received emails. I love the physical keyboard for typing out longer emails. I love the little leather wallet it comes in. In short I am sending more and more emails via it, than my iPhone. Have I turned to the dark side? Am I bordering on, CrackBerry status? The battery life on this particular phone is shocking. The BlackBerry app store compared to that of Apple or Android is like something 6th formers at a local comprehensive did as a practical pleaseantry in ICT. Don't get me started about using one to search the internet! Not to put too fine a point on it - it's pants. None of that really matters. BlackBerry phones work well and with an iPhone in one pocket and a BlackBerry in the other I can have the best of both worlds...can't I? What do you out there think? Brompton back from being serviced. Cargo shorts made for Brompton riding?? ?